Choosing the wrong mobile app provider could mean months of delay, a poorly designed user experience, and worst of all—dollars wasted. Districts need to make sure they apply the same planning and project management principles to mobile apps as they would to any other IT project. It is important to research, evaluate, and vet each potential partner thoroughly. This mobile app evaluation guide gives you the top ten things to consider when purchasing a mobile app. 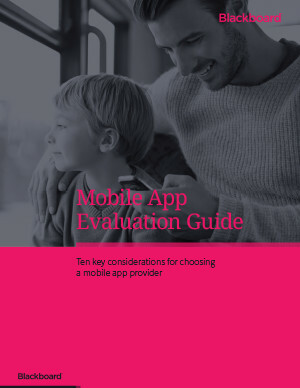 Download your copy to discover the critical things you must consider and the right questions to ask as you evaluate mobile app providers. *Your privacy is important to us. You can change your preferences or unsubscribe at any time. We will only use the information you have provided to manage your inquiry unless we have permission to send you our email communications. We may share your information with the relevant local Blackboard channel partners (resellers) if your organization is located in an area managed by Blackboard partners (see list here). View our Privacy Statement for more details. Copyright © 1997 - 2018. Blackboard Inc. All rights reserved. See Blackboard trademarks and patents.